Home » Copywritten vs. Copyrighted – What’s the Difference? If you are reading this article because you have been reproducing legally protected material without authorization and now need legal counsel, you should look elsewhere. I am not a lawyer, and cannot provide sound advice in legal matters. On the other hand, if you are curious because you would like to improve your writing and want to make sure you choose the best word for a given context, then continue reading for an explanation of these confusing terms. 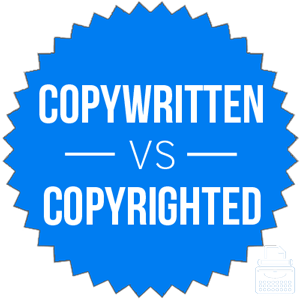 What is the Difference Between Copywritten and Copyrighted? In this post, I will compare copyrighted vs. copywritten. I will outline the differences between these terms and advise you on which is correct. Plus, I will show you a helpful memory tool that will make choosing either copyrighted or copywritten much simpler. What does copyrighted mean? Copyrighted can be an adjective or a verb. As an adjective, copyrighted describes property that has been legally secured against unauthorized reproduction. Audrey scoured the Internet for images to use in her presentation slides, paying no attention to whether or not they were copyrighted material. Abilene found herself in deep legal trouble when she attempted to publish a copyrighted book as her own work. Copyrighted can also be the past tense conjugation of the verb copyright, which means to apply legal protection to something against unauthorized reproduction. Anders always made sure he copyrighted his songs before selling albums at his shows. Aliyah copyrighted the recording of her high school valedictory speech, and sued the school when they put it on YouTube. What does copywritten mean? Copywritten is a misspelling of the word copyrighted. It is an error whether it’s used as a noun or a verb. It’s easy to understand why this mistake is so common. The noun copywriter refers to a person who writes copy (in this case, another word for material). Someone unfamiliar with legal jargon might assume that a copywriter is a person who writes copyrights, and thus overextend the noun’s usage to other contexts and parts of speech, as well. Nonetheless, copywritten is always considered a mistake. The graph below demonstrates that this word is not used in published work. Its use is so low as to approximate zero. This chart isn’t 100 percent exhaustive in its scope, since it only looks at books published in English since 1800, and not other sources, like magazines and legal documents. Still, it provides a good illustration of each word’s use (or lack thereof) over time. You should only ever use copyrighted. It is the standard form of this word as both a verb and an adjective. The associated noun is copyright, which can be thought of as the right to copy something. Think of the “w” in copywritten as standing for wrong. It is the wrong spelling. Is it copywritten or copyrighted? If you have something copyrighted, you have legal protection against unauthorized reproduction of it. Copyrighted is the correct spelling. Copywritten is a spelling error. 1 What is the Difference Between Copywritten and Copyrighted?